Merry Christmas, my lovely peeps. Thank you all for reading, for commenting, and for supporting this endeavor over the past year or so! It's totals the best present anyone could ask for - though the coffeetable book on 100 years of Women's Wear Daily from the Manfriend and the ice cream maker we got from my parents are also highly enjoyable. 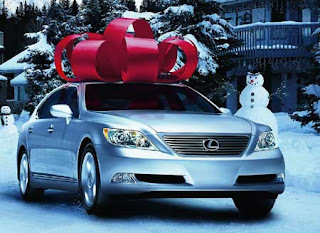 I hope your day is (or has been) full of love, laughter and copious calories - and don't skimp on that mistletoe! It's coooooooold out there, and gettin' some is an EXCELLENT way to stay warm! I'm adding another December holiday to the glorious Kwanschristmukkah celebrations already afoot: I hereby decree December 15th as International Going Down Day! If you're in a position to go down on someone (in a consensual and appropriate manner, of course) tomorrow is the day to do it! 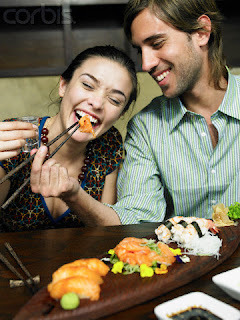 they're eating out*, and look how happy she is! Scientists (respected scientists, even!) have received $6.5 million pounds (about $10.2 million US) from the British government to develop a rapid urine STD test - for your PHONE. And I thought Grindr was clever! I got totally whacked with schoolwork this week, so my World AIDS Day post is, as my father would say, a day late and a dollar short. I had planned to do a recap of all the crazy (in a good way) and wonderful things that happened in the world of AIDS this year (no cure or anything, but exciting nonetheless), but I have treatment plans that need to get done and I got all screwed up with Thanksgiving and EXCUSE EXCUSE EXCUSE, but hey - you got some awesome links there, and here is a super cute AIDS awareness penguin for your enjoyment. I'm naming him F.U. AIDS Penguin. F.U. 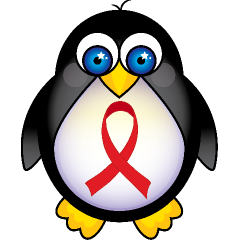 AIDS Penguin (who I had no part in the creation of - buy t-shirts here!) is dedicated not only to the millions of people affected with HIV in the world and those who work tirelessly to fight it, but also to T-Zous, my favorite penguin-loving Jew since 1991, who gave birth to an absolutely beautiful 7 pound baby girl early on World AIDS Day Eve (a.k.a. Nov. 30). A big fat Mazel Tov to you, my girliefry - let's go eat sushi!